Cassandra Firewall from DataSunrise protects corporate and proprietary databases against any types of external and internal threats. All unauthorized database activity is detected and blocked. Protection is effected through highly customizable rules that ensure the unprecedented level of database safety. Security personnel can be notified immediately in case of suspicious or threatening activity. Cassandra Firewall by DataSunrise is a highly effective tool aimed at protecting sensitive data. This universal tool protects data both on-premises and in the cloud against user negligence, any potential threats and all external attacks. Compliance with national and international data protection regulations is impossible to achieve without using Firewall for your Cassandra database(s). In order to work effectively Cassandra database Firewall by DataSunrise should operate in the proxy mode. In this mode it scans and intercepts communication between a user and the database. It plays the role of the audit checkpoint, logs and filters traffic and blocks queries not meeting strict security policies. After deployment of the Firewall tool a set of learning rules can be added. In the result DataSunrise will be analyzing all incoming database traffic, disrupt attempted SQL injections and generate a list of common requests that from now on will be viewed as safe and used to build an impenetrable for unwanted users firewall around your Cassandra databases. When processing the database traffic DataSunrise Firewall analyzes everything: all the queries to a database, retrieved information, etc. Queries are subjected to especially stringent analysis and those not meeting the user set security rules are blocked. All DDL and DML transactions are processed and tracked. High-availability. Automatic failover in case one of the servers is down. Functioning as authentication proxy. There is a possibility to configure user mapping for Active Directory users with the support of Kerberos protocol. Scalable security rules for filtering SQL transactions according to an application, database user, attack signatures, signs of SQL injection. 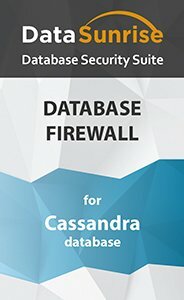 Cassandra Firewall from DataSunrise is a reliable tool protecting your databases from SQL injections, unauthorized access and keeping your data safe.